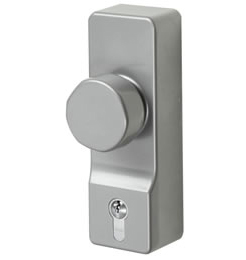 An OAD is an Outside Access Device; this is fitted on the outside of a final exit door which has been fitted with Panic or Emergency Exit Hardware on the inside. The OAD allows access from the outside by authorised persons. The OAD can also be locked to allow non-key holders to gain entry. A great example of one of these is the EXIDOR 302EC (pictured) which can be integrated into your existing masterkeyed suite, if required. This entry was posted in panic hardware and tagged 302EC, Emergency Exit Hardware, exidor, OAD, outside access device. Bookmark the permalink.